In-ground pools are our specialty. 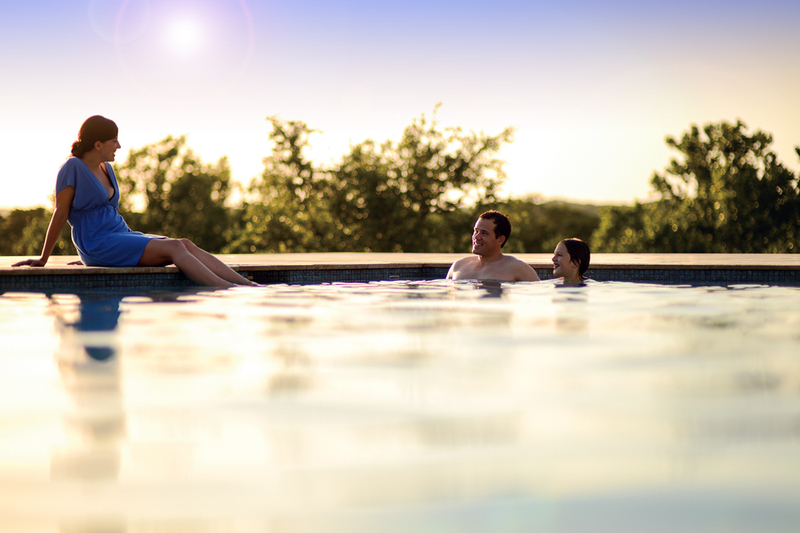 Thousands of pools installed…thousands of happy customers. We pride ourself on the quality of our construction. Our values have not changed over the past decades. We strive to build the best pool available. This attitude and dedication is what got us placed on Aqua Magazine’s national Top 100 Pool Companies list. We build quality vinyl-lined and gunite pools of all shapes and sizes. We build our vinyl-lined pools totally in house. The basic structure includes a galvanized steel wall, braced, squared, and leveled, surrounded by a generous concrete belt to support the structure. The interior includes a hard pool bottom designed for structure and drainage, foam lined walls, and a perfectly fit vinyl-liner of your color choice. The top edge can be an aluminum receptor coping which your deck is poured into, a simple liner extrusion which your deck can extend over with a finished edge, or any type of brick, coping stone, or granite that you may desire. We utilize our own crews plus two specialized crews in our gunite construction. Without the right installer, the construction of a gunite pool can linger on forever. 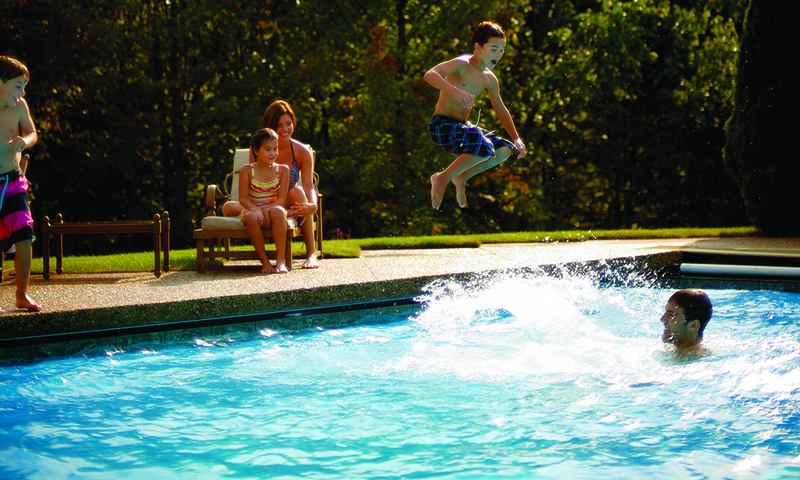 Family Pools promises to finish your project in a timely fashion once it is started. We do more of the installation in-house than most other companies. We do our own excavation followed by steel reinforcement, shoot the gunite shell using a one foot thick beam, plumb the structure and backfill. 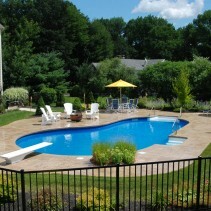 Once the pool decking is complete, a tile trim and interior finish of your choice are applied. Many fascinating and decorative interiors are available including plaster, stone, sea glass, glow stones, and more. A vinyl-lined pool is merely a stack of wall panels, some concrete, and a vinyl-liner prior to construction…a gunite pool is a bunch of wire, a truck full of concrete, a finish, and some plumbing… just as a painting is merely a canvas, a brush, and a bunch of paints until it is created. It is how these tools are used and how these supplies are handled and put together that forms the quality of your artwork. 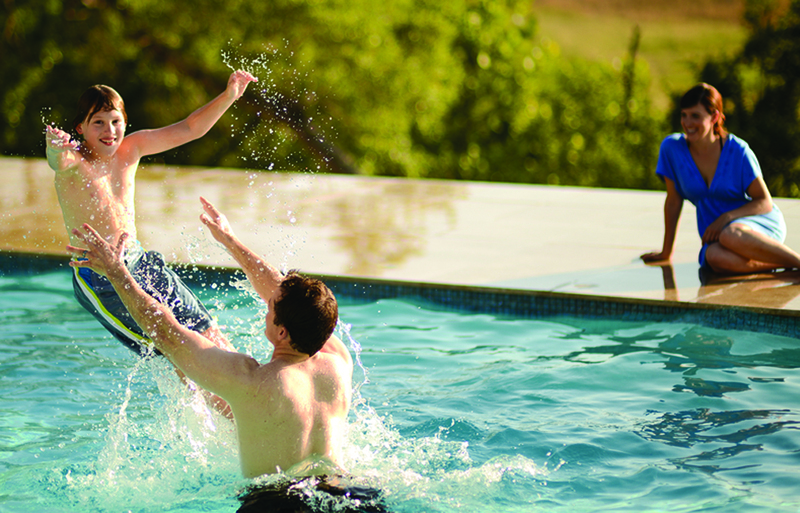 Let Family Pools be your Picasso. There are a great variety of standard shapes in which to start your thinking process. Choose one of these shapes or customize your own design. From a modest rectangle to an elaborate design, from a small personal pool to a grand commercial structure…the sky’s the limit. See our gallery of in-ground pools for ideas. Contact Tiffany at (978) 688-8307, extension 19 to request more information or to book an appointment. We are happy to sit down with you and explain the many accessories and options available for your pool needs. Our salesmen have been with us for 30 years, starting as installers and moving to sales during their career. Please let them know if you have seen any other options which are of interest to you that we did not mention or that you don’t see listed in our brochure or on our website. We can offer you anything that is available within the pool industry that we deem quality worthy and suitable for a New England installation. See our gallery of gorgeous in-ground pools!